If you are looking for something really new and fun to do with your bridesmaids, yoga bridal party classes may be just the thing. Yoga classes are a great way to bond with your bridal party, not to mention to do some serious relaxing in a period of time when each day seems to be more stressful than the day before. 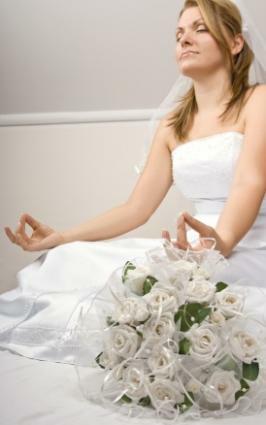 If you are in a major metropolitan area, there are countless options for a yoga class for you and your bridal party. Call some studios, or look them up online, to see what they have available. Many studios will be more than happy to create something special for you, even if they have not yet heard of the new trend of yoga bridal party classes. Most studios have several instructors, so there is bound to be an instructor or two at the studio who is interested in making a little extra money and having tons of fun at the same time. Yoga teachers often offer private lessons to various groups. If you can afford a private lesson, this option is a great way to bond with your bridesmaids and have some time to yourselves. Private lessons can cost anywhere from $50 to $200 or more, depending on the level of experience of the instructor and the geographic region. While these prices may sound high compared to a private lesson for one or two people, a yoga class for your entire bridal party can be a very fun and relatively affordable activity. You can all have a lot of fun together by simply choosing a yoga class that fits into all of your schedules (Saturday morning, for example) and going together each week. The class and the weekly meeting is a good chance for bonding. You can also go out for lunch together or fresh juice after class. Whether you use the opportunity to plan wedding details or simply to relax together, the experience is sure to be a positive one. Planning a wedding is often an expensive endeavor, and even if you find a relatively cheap yoga class, it can add up, especially if you are going to go weekly and not just have a one-time class on the wedding weekend. So another alternative is to create your own weekly group yoga class. As the organizer of the class, you can collect a few yoga DVDs and do a different DVD each time. This option can be just as much fun and much less expensive than a private instructor or a group class. In addition, you can plan the class flexibly instead of having to find an existing class that fits everyone's schedules or making an appointment with a private instructor. For bridal parties who want to go all out, why not take a yoga vacation in the Caribbean? As long as you have the funds and the vacation time for this option, it can be the time of your lives. Regardless of the type of class you choose and how often you and your bridal party do yoga together, it is an opportunity to spend time together doing something that is unrelated to the wedding, which may be just what all of you need!